Špilberk n For over seven centuries, Špilberk Castle has dominated the skyline of Brno. Špilberk n Po více než sedm století je hrad Špilberk dominantou Brna. Over the course of the centuries, the importance of Špilberk and the part it has played have changed considerably. 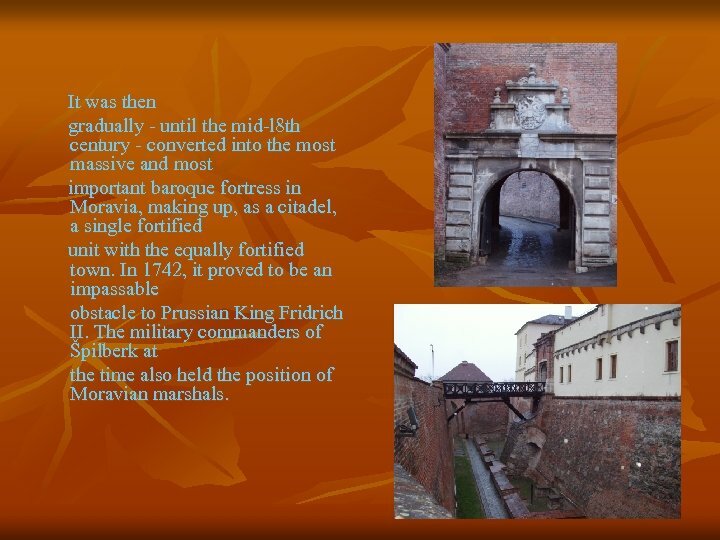 From a major royal castle and the seat of the Moravian margraves, it gradually turned into a huge baroque fortress, the heaviest prison in the Austro-Hungarian empire (the infamous "dungeon of the nations"), and then a barracks. Today, Špilberk house the Brno City Museum, and is one of the most significant cultural centres in Brno. It was certified as a national heritage monument in 1962. Brněnský hrad Špilberk byl založen okolo roku 1270 za krále Přemysla Otakara II. , který se na hradě velmi rád zdržoval. Za Lucemburků Špilberk dospěl k největšímu rozkvětu, tehdy na hradě pobýval markrabě a pozdější král a císař Karel se svou manželkou Blankou z Valois. Karlův bratr Jan na Špilberku setrval po 25 let. The castle was established around the mid-13 th century on fairly low, but rather steep, rocky hill (290 m), rising directly over the historical centre of the town (at about 220 m). Its builder, Czech King Přemysl Otakar II, approached it as a solid pillar of royal power as well as a seat for the rulers of Moravia, worthy of respect. 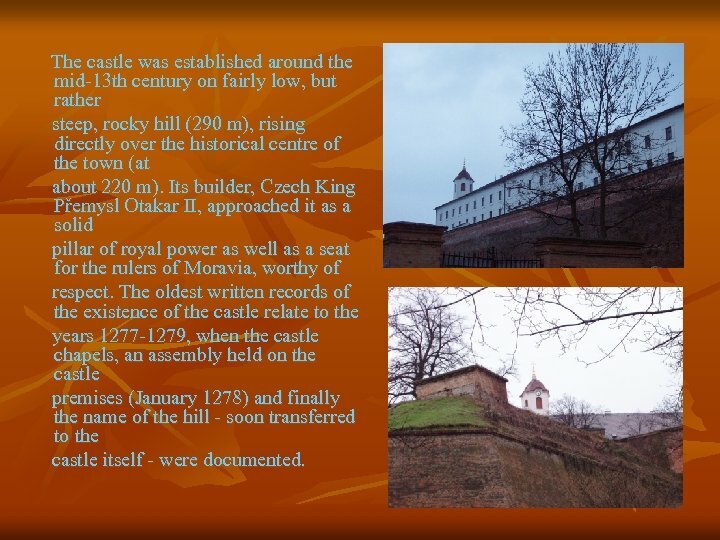 The oldest written records of the existence of the castle relate to the years 1277 -1279, when the castle chapels, an assembly held on the castle premises (January 1278) and finally the name of the hill - soon transferred to the castle itself - were documented. Během husitských válek vlastnil Špilberk Albrecht. Po jeho smrti se hradu zmocnili brněnští měšťané a soudili zde husitské přívržence. Za Viktorinovy vlády byl Špilberk obležen vojsky uherského krále Matyáše a postupně vyhladověn. V Matyášově moci zůstal hrad až do jeho smrti roku 1490. 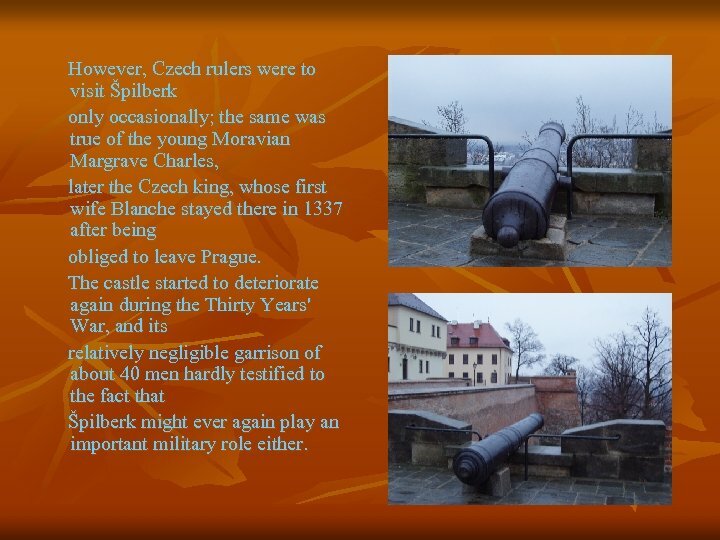 However, Czech rulers were to visit Špilberk only occasionally; the same was true of the young Moravian Margrave Charles, later the Czech king, whose first wife Blanche stayed there in 1337 after being obliged to leave Prague. 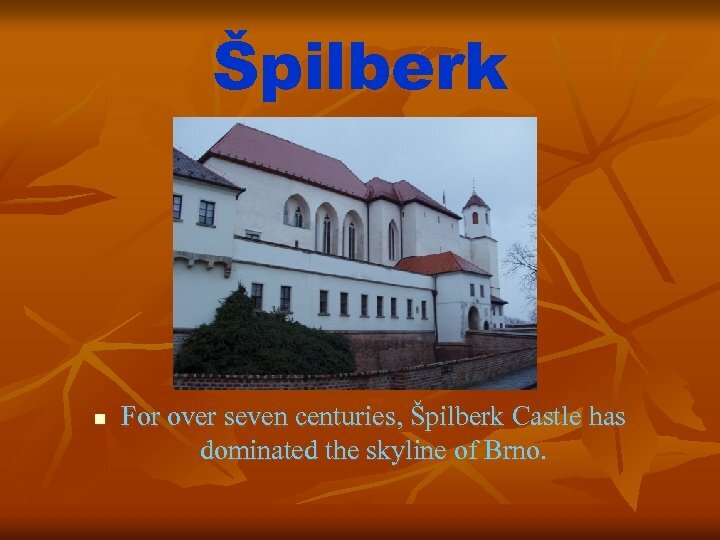 The castle started to deteriorate again during the Thirty Years' War, and its relatively negligible garrison of about 40 men hardly testified to the fact that Špilberk might ever again play an important military role either. Potom hrad opět putoval do zástavy, ze které ho vykoupil Ferdinand I. . Roku 1560 Špilberk odprodal brněnským měšťanům. Po roce 1620 byl Brňanům Špilberk zase odebrán a sloužil jako vězení pro povstalce. V druhé polovině 16. století hrad vyhořel a potom byl opraven, z té doby pocházejí obloučkové atiky na vnější fasádě. 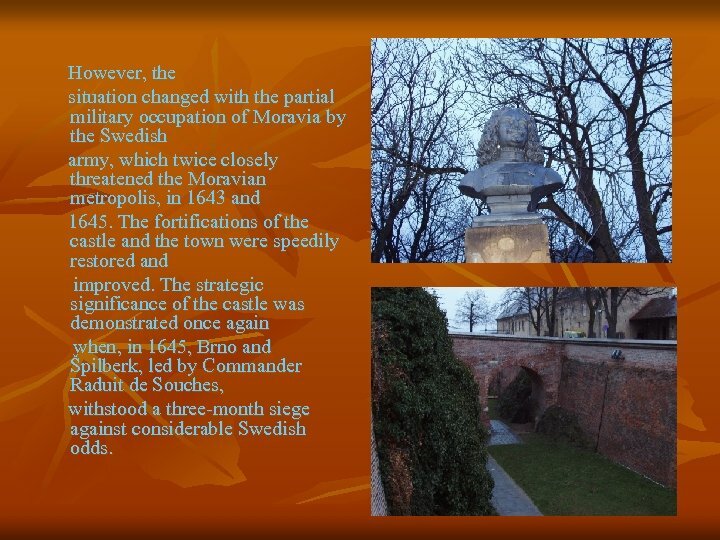 However, the situation changed with the partial military occupation of Moravia by the Swedish army, which twice closely threatened the Moravian metropolis, in 1643 and 1645. The fortifications of the castle and the town were speedily restored and improved. The strategic significance of the castle was demonstrated once again when, in 1645, Brno and Špilberk, led by Commander Raduit de Souches, withstood a three-month siege against considerable Swedish odds. V polovině 17. století začala na Špilberku přestavba, jenž trvala asi sto let a hrad se během ní změnil v mohutnou, barokní, vojenskou pevnost, na které se podílel významný pevnostní architekt plukovník ing. Pierre de Rochepin. Roku 1742 byla dokončena stavba hradních kasemat a v té době také vznikla kasárna a terasa pro palební postavení. 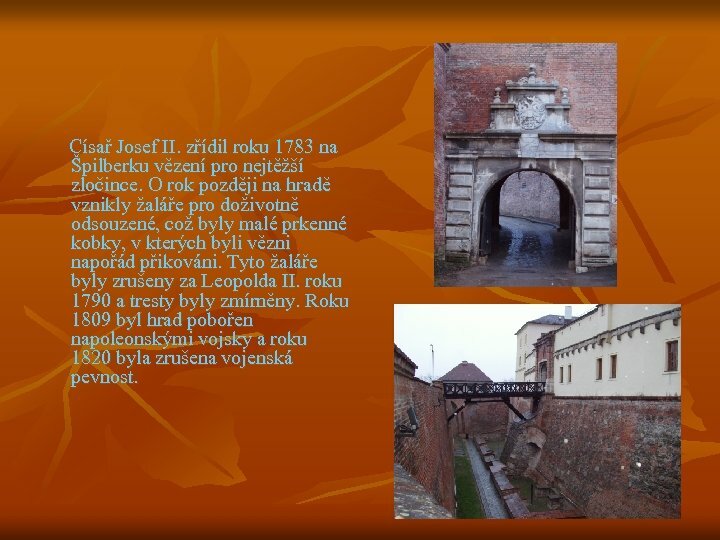 It was then gradually - until the mid-l 8 th century - converted into the most massive and most important baroque fortress in Moravia, making up, as a citadel, a single fortified unit with the equally fortified town. In 1742, it proved to be an impassable obstacle to Prussian King Fridrich II. The military commanders of Špilberk at the time also held the position of Moravian marshals. Císař Josef II. zřídil roku 1783 na Špilberku vězení pro nejtěžší zločince. O rok později na hradě vznikly žaláře pro doživotně odsouzené, což byly malé prkenné kobky, v kterých byli vězni napořád přikováni. Tyto žaláře byly zrušeny za Leopolda II. roku 1790 a tresty byly zmírněny. 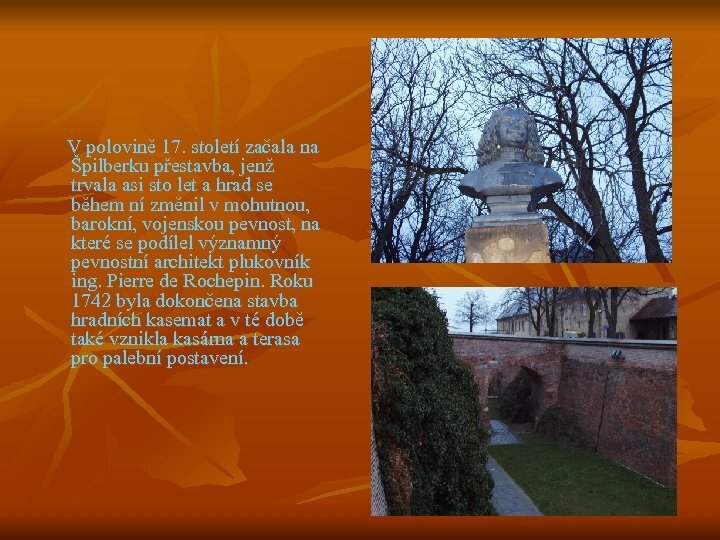 Roku 1809 byl hrad pobořen napoleonskými vojsky a roku 1820 byla zrušena vojenská pevnost. 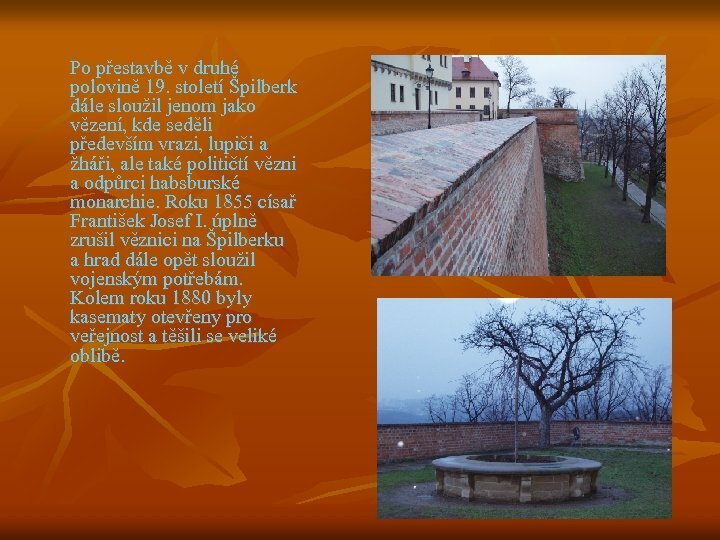 A prison had always constituted part of the Špilberk fortress. Shortly after the defeat of the Uprising of the Estates in 1620, the leading Moravian members of this anti. 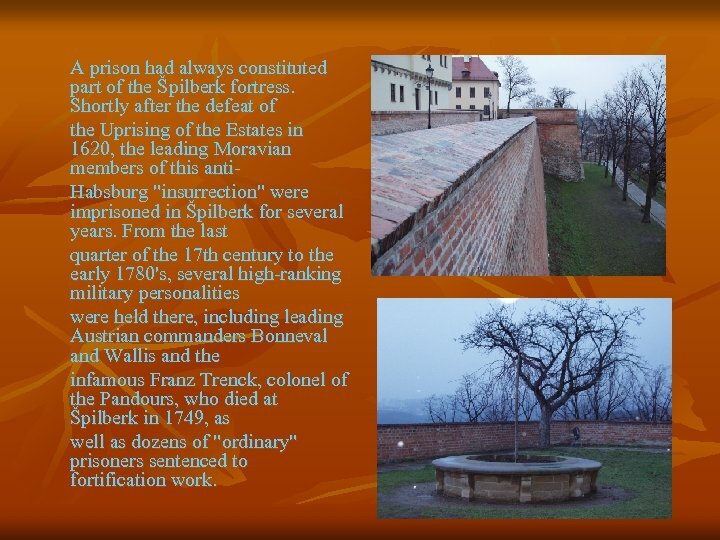 Habsburg "insurrection" were imprisoned in Špilberk for several years. From the last quarter of the 17 th century to the early 1780's, several high-ranking military personalities were held there, including leading Austrian commanders Bonneval and Wallis and the infamous Franz Trenck, colonel of the Pandours, who died at Špilberk in 1749, as well as dozens of "ordinary" prisoners sentenced to fortification work. Po přestavbě v druhé polovině 19. století Špilberk dále sloužil jenom jako vězení, kde seděli především vrazi, lupiči a žháři, ale také političtí vězni a odpůrci habsburské monarchie. Roku 1855 císař František Josef I. úplně zrušil věznici na Špilberku a hrad dále opět sloužil vojenským potřebám. Kolem roku 1880 byly kasematy otevřeny pro veřejnost a těšili se veliké oblibě. 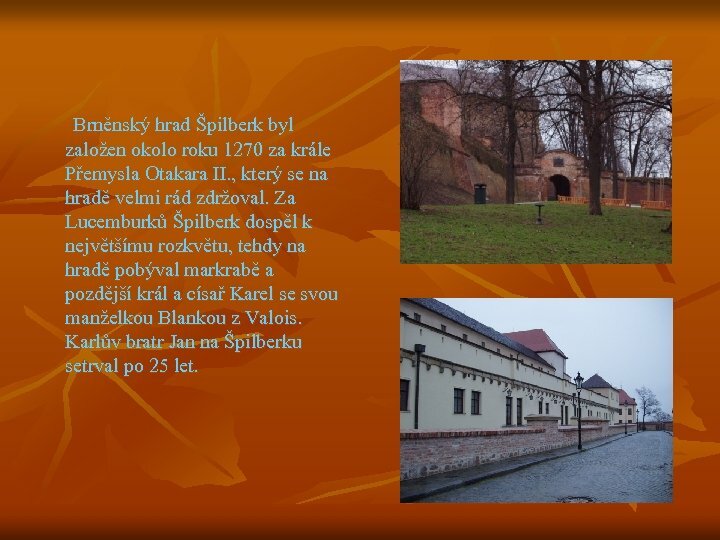 In 1783, Emperor Joseph II decided that Špilberk should no longer function as a fortress prison and that it should be converted into a civil prison intended for the most hardened criminals. For this purpose, the casemates, parts of the fortress system that had hitherto been insufficiently used, were reconstructed. Their mass cells could hold as many as 200 prisoners. 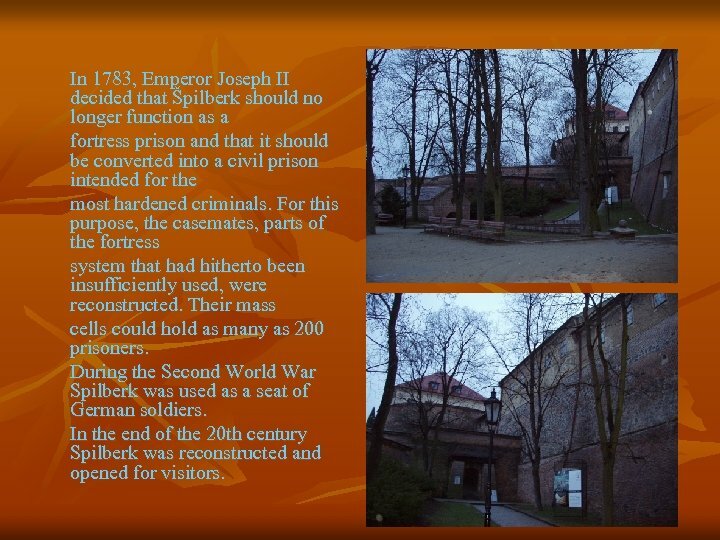 During the Second World War Spilberk was used as a seat of German soldiers. In the end of the 20 th century Spilberk was reconstructed and opened for visitors. Během 2. světové války se část kasemat proměnila v kryty pro německou posádku, která se na Špilberku usadila. Rekonstrukce z let 1987 -92 se pokusila vrátit kasematy do doby Josefa II. a ukázat návštěvníkům dřívější podobu nejtvrdšího žaláře opředeného hrůzostrašnými legendami.